Mountain Zebra National Park is a stronghold for the endangered Cape mountain zebra. The Mountain Zebra National Park is a beautiful mountain wilderness with valleys and grassy plains. It has been described as one of South Africa's most scenic national parks. Mountain Zebra National Park is also the setting of one of the miracles of conservation - the rescue of one of the world's most endangered species, the Cape mountain zebra, from the brink of extinction. Mountain Zebra National Park is set in the magnificent Karoo close to the town of Cradock in the Eastern Cape, and sized at 6 536-ha. In addition to the Cape mountain zebra, the park hosts herds of several other species of large game such as eland, red hartebeest, kudu and black wildebeest. At least 200 bird species have been identified thus far. There is also a three-day, two-night hiking trail which rates as one of the finest in South Africa. The rest camp facilities at Mountain Zebra National Park have been in use for more than 10 years. The Mountain Zebra National Park is typical of the Eastern Cape's Karoo country. This means that you will find Karoo aster, Koggelmandervoetkaroo and globe Karoo and all colorful varieties of local Karoo plant species in the park. You will also find aloe- and bush-covered mountains and valleys where the white stinkwood and wild olive grow. One particular aspect of the Mountain Zebra National Park that will immediately strike you is the concentration of game on the area known as the Rooiplaat Plateau around the curves of one of the game viewing roads. At any given moment, about 85% of the large herbivores in the park will be found here. The reason for this occurrence is the fact that Rooiplaat consists of sweet grassland, which the grazers prefer to the sour grasses and Karoo scrub covering most of the rest of the park. 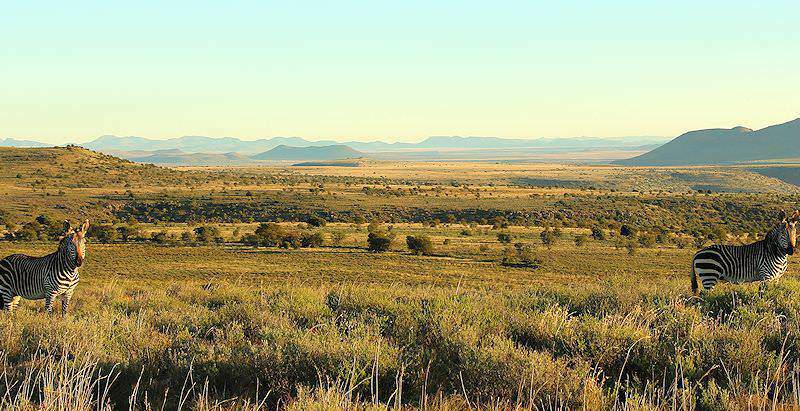 The views across the Karoo grasslands are remarkable, and nothing prepares you for the vastness in contrast to the unbroken view of the mountains. The private accommodations within the park are perfectly situated on a ridge overlooking the plains with the mountains in the background, which makes it the perfect place to enjoy sunsets and cloudless nights. The Mountain Zebra National Park is inhabited by various strange creatures that you will not see on traditional safaris. This includes the endangered Cape mountain zebra, after which the park was named , and the innovative ground squirrel, named so because they do not climb trees like the rest of the squirrel family. There are three sites in the park where visitors can view the rock art that was made by the San people more than three hundred years ago. There are also various sites that where stone artifacts were found that bear witness to the Stone Age inhabitants that lived in the area more than 10 000 years ago. Guests visiting the Mountain Zebra National Park will usually do so as part of an extended safari down the coast. 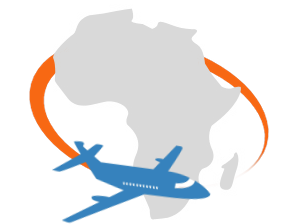 You will therefore be flying either to Cape Town International or George Airport from Johannesburg and stop at various destinations en route to the Eastern Cape. If the park is your first destination on your itinerary, a flight to Port Elizabeth will be arranged. A safari from Cape Town to the Garden Route and then from the Western Cape into the Eastern Cape covers one of the most scenic coastal regions of South Africa. The park is situated approximately 9 hours’ drive from Cape Town, but is only 3 hours from Port Elizabeth. No matter where you come from, African Sky will ensure that you are driven in a private, air-conditioned vehicle. Just like the unique Cape mountain zebra, the park is different to most of the other national parks. Its main attraction can be seen all year round, and is quite easy to spot. The area gets extremely cold in the winter, with temperatures dropping below freezing point, and snow occurs often in the area's mountains. The summer months are less extreme, and visiting the park is comfortably warm from October to March. The park is situated in a summer rainfall season, and most of the rain occurs from December to February. The summer months are also the best time to view birds, new-born animals and the blossoming flora. The Mountain Zebra National Park was established in 1937 and was pivotal to the survival of the Cape mountain zebra. The Cape mountain zebra seemed to await the same fate as its cousin the Quagga, which went extinct on 12 August 1883 when the last individual died in Amsterdam Zoo. The Cape mountain zebra was once classified as endangered, but is now classified as vulnerable by the IUCN red list. In the late 60’s, there were only 140 Cape mountain zebras left, but the population grew to 200 by 1979 with the Mountain Zebra National Park, accounting for 75% of the global population. By 1984 ,the population reached 400, and since then Mountain Zebra National Park has been able to reintroduce Cape mountain zebras to other parks. Mountain Zebra National Park is filled with modern and ancient anthropogenic history. The area was once occupied by Later Stone Age people between 14 000 to 10 000 years ago, and Bushmen more recently. Stone artifacts are all that is left of the Stone Age inhabitants and paintings on the rock faces give testament to the Bushmen that were once residents. During the Anglo-Boer War the British soldiers made a chessboard on top of Saltpeterskop, a 1514 meter high peak, and played chess against soldiers at the old fort in Cradock. They transmitted the moves by means of a mirror. The chess board can still be seen etched into a flat rock slab along with names of soldiers that were stationed there. As the park's name suggests, Mountain Zebra National Park is the best place in the world to view the Cape mountain zebra. The park now has over 700 mountain zebra. All the Big Five animals except the elephant occur. The buffalo can normally be found in the areas with acacia thicket and in the wooded valleys. Black rhinos are present, but to see them you may have to stay here a while or just enjoy a stroke of very good luck. To find lion, one really has to look for them, and the highly elusive Cape mountain leopard is hardly ever seen. Similarly, the mysterious brown hyena does not like to be spotted, either. Cheetahs are easier to track, as they have been collared for research purposes. All you need is a guide with a telemetry tracker, which increases the odds of finding them greatly. The park is also home to rarely spotted lesser mammals like aardwolf, bat-eared fox and caracal. Nocturnal species such as Cape fox, aardvark, genet, black-footed cat and striped polecat can be found with a spotlight on a night drive. Antelope are plentiful, and the chances are good that you will encounter eland, kudu, blesbok, black wildebeest, red hartebeest and springbok. Vervet monkeys and Chacma baboons are common. Black-backed jackal, yellow mongoose and ground squirrels are seen often. A wide variety of birds occur here, especially big species like secretary birds, blue cranes, Verreaux's eagles and many more. At least 275 species have been identified. The Mountain Zebra National Park is known for its threatened vegetation types, which include the eastern upper Karoo and therefore the Nama-Karoo biome. The two other vegetation types found in the park include the Karoo escarpment grassland, and Eastern Cape escarpment, which consists of the grassland and thicket biomes. The different vegetation types are important for conserving the area's biodiversity and aesthetic appeal. The relationship between the different biomes stimulates a rich mix of flora and fauna whilst simultaneously preserving the ground. All three biomes are currently very under-conserved in South Africa. An inquiry into the plant species found in the park revealed approximately 680 species, of which 13 are Red Data species. The park is extremely important for the conservation of the widely unprotected biomes and plant species, as nearly a quarter of South African flora is considered to be either threatened by extinction or of conservation concern due to habitat loss, invasive alien species and other dangers. The park also features endemic fynbos that has previously only been documented in the Outeniqua Mountains, Koue Bokkeveld and Tsitsikamma. These areas are almost 500km away from the park. The Mountain Zebra National Park is special in that it offers the opportunity to see a number of unusual wildlife species. A game drive led by an experienced game ranger is an excellent way of getting to know the various unique animals that call the area home, which include the Cape mountain zebra, cheetah, aardwolf and caracal, to name a few. Drives are available in the early mornings, late afternoons and in the evenings. Self-guided and guided walks ensure that guests can truly immerse themselves in the flora of the habitat, but be sure to stay vigilant when walking without a guide. The Salpeterkop Hike and other longer trails are sure to get the blood pumping, but it is important that guests are medically fit to undertake the exploration as it can be quite taxing. Guides are also known to go off the beaten track - depending on your interests and degree of fitness - and they are always keen to share their knowledge of the area and the animals with guests. If you are up for a small challenge, clambering over a few rocks will give you the opportunity to view some San rock art paintings tucked away in ancient caves. The birdlife is exceptional, especially in the early mornings, and birders can be on the lookout for the majestic blue Crane and eastern clapper lark. The most memorable experiences at Mountain Zebra National Park include the park's spectacular wildlife, particularly the threatened mountain zebra for which the park is named, as well as the vulnerable cheetah - two precious endangered species. Game drives and walks committed to tracking the cheetah are exhilarating. With a bit of luck and a lot of help from the guides, you can find one of the masters of camouflage. It is a true tracking experience and a great way to learn more about these magnificent endangered creatures. One of the reasons that animals such as the Cape mountain zebra and cheetah flourish in this region is because of its unique terrain. Plains stretch out endlessly towards the mountains that seem to color the sky in a variety of blue hues from afar. Your chances are quite good, as rangers can track some of the animals via radio telemetry. 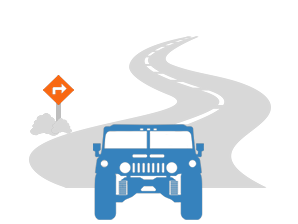 Are there places where it is safe to get out of the vehicles? Yes, it is safe to get out of the vehicles at picnic spots and at certain demarcated areas. Is there cell phone reception? There is cell phone reception in most parts of the park. There are pools at some of the cottages and lodges. Do we need to bring our own water? The tap water is safe and drinkable, but we will nevertheless always ensure that bottled mineral water is readily available. Do activities need to be booked in advance? You can book activities upon arrival, but if you have a specific preference it may be worth pre-booking. Kindly let us know so that we can ensure availability. Is there any sort of shop in the park? There is a small gift shop where basic food supplies and toiletries can be purchased. South Africa is one of the finest destinations for a truly memorable African vacation. Botswana is one of the top destinations in Southern Africa for an authentic safari. Namibia is a sprawling desert country offering a wealth of safari vacation options. Travel to Zambia for a wonderfully remote safari experience. Zimbabwe's most popular feature is the natural world wonder of the Victoria Falls. Mozambique's top destinations are the Bazaruto and Quirimbas archipelagos. The Kruger National Park is South Africa's premier safari destination, hosting the Big Five and 142 other species of mammals. The Sabi Sand Private Game Reserve hosts some of the most luxurious lodges on the African continent, from Londolozi to Singita. Cape Town is known as South Africa's 'Mother City'. It is the country's oldest city, but also its most beloved and an enchanting destination. The Garden Route is a verdant coastal region that stretches from Mossel Bay in the Western Cape to Storms River in the Eastern Cape.